If you like traveling in an RV, there is a good chance you like exploring the great outdoors too. After a day filled with outdoor activities like hiking and cycling, you’ll definitely enjoy a nice shower. While a cold shower might be fine during hot summer months, the weather won’t always be nice. Being able to take a hot shower makes a huge difference when it’s cold outside. Traditional water heaters with tanks take up a lot of space, so installing one in your RV wasn’t always an option. Luckily, tankless water heaters are much smaller, so you can have hot water in your RV even if you have very limited space. 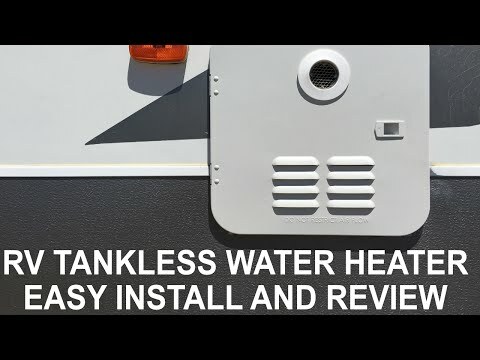 This guide will tell you everything you need to know in order to find the best RV tankless water heater for your needs. Eccotemp is a company based in South Carolina that focuses on making energy-efficient products. They make various types of water heaters both for outdoor and for indoor use, but their line of portable heaters is definitely the most popular. These portable water heaters come in three different sizes and the Eccotemp L10 is the most powerful model. This 74,500 BTU water heater delivers up to 2.6 gallons of hot water per minute. The Eccotemp L10 uses liquid propane. It comes with a gas regulator and 9-foot hose that will allow you to connect your water heater with a standard 20lb propane tank. Furthermore, this tankless water heater for RV comes with a battery-powered ignition. Therefore, you don’t need to have an electrical connection to use this amazing product which makes it perfect for off-grid use. You just need two D cell batteries, and you are all set. Once the water starts flowing, the heat will be turned on automatically. The Eccotemp L10 is quite small- it is 25.5. Inches high, 13.62 inches wide and only 7 inches deep. It doesn’t weigh too much either – only 27 pounds. No matter how big or small your RV is, it shouldn’t be hard to find a suitable place to install your water heater. What we really like about the Eccotemp L10 are the controls that allow you to adjust the water pressure and temperature. The control knobs are located at the front of the unit. Even though the Eccotemp L10 is a very budget-friendly water heater, there is a small downside. It doesn’t come with a showerhead and hose although you can purchase those separately. However, this water heater should work with any showerhead and hose. This natural gas tankless water heater from Takagi delivers up to 140,000 BTU per hour. The maximum flow rate it offers is 6.6 gallons per minute. That is more than enough to have two separate devices running at the same time. People have used this Takagi water heater even in apartments with two bathrooms and haven’t had any problems. Therefore, it is definitely powerful enough for a comfortable shower in your RV. Furthermore, this Takagi water heater is not only powerful but also consume less energy. This model has received the Energy Star certification, and its energy factor is 0.82. The unit is 20.3 inches high, 13.8 inches wide, and 6.7 inches deep. It must be installed indoors, but it is quite small and thin so finding space to install it inside your RV shouldn’t be a problem. The unit weighs 38 pounds. While you can definitely find a cheaper tankless water heater, the Takagi T-KJr2-IN-NG is definitely worth the investment if your budget allows it. It’s a very reliable and functional unit, thoughtfully designed down to the finest details. It operates very quietly, and it can be used safely on altitudes up to 6000 ft. Last but not least, this Takagi water heater also comes with a remote control that allows you to adjust the temperature precisely. The Takagi T-KJr2-IN-NG comes with a 10-year warranty on the heat exchanger and a 5-year warranty on all other parts. This unit from Rinnai has an energy factor of 0.96 which is almost as high as it can get. It is one of the most efficient water heaters you can find. If you read any of the Rinnai tankless water heater reviews, which are easy to find on the web, you’ll notice that there are also many other features people love about this unit. First of all, the Rinnai RUC98iN is quite flexible when it comes to fuel and venting options. You can use either natural gas or propane, and you can choose between concentric and twin-pipe venting. This unit is 20 inches wide, 26 inches high and 10 inches thick. Furthermore, it weighs 61.7 pounds which makes it much bulkier and heavier than other models on our list. However, this is not necessarily a bad thing. With bigger size comes greater power and the Rinnai RUC98iN can deliver up to 199,000 BTU per hour. In other words, it provides almost 10 gallons of hot water per minute when used at maximum capacity. The heat exchanger on the Rinnai water heater is covered by a warranty for 12 years and all other parts are covered for 5 years. However, you’ll need to hire a certified Rinnai technician to install and maintain the unit. If you want a powerful, reliable, and energy-efficient RV on-demand water heater, this unit from Rinnai is certainly not a bad choice. It’s powerful enough to provide hot water for two bathrooms at once. It also comes with built-in freeze protection so you can use it safely throughout the year. The PrecisionTemp RV-550 Tankless Water Heater was designed specifically with RVs in mind. The unit is 13.5 inches wide, 14.25 inches high, and 13.5 inches thick. It’s really easy to install, and the exhaust vent is located right on the outside panel. This PrecisionTemp water heater features an automatic gas modulation system. Thanks to the built-in sensors, the unit can measure the temperature of the incoming water and the intensity of the water flow. Based on this information, it automatically adjusts the gas burner in order to ensure consistent output temperature. The built-in freeze protection system is probably the coolest feature on the water heater. Small 12V heaters protect the internal components of the unit. The heater also comes with a thermostat that will turn the gas burner on low heat if the temperature outside reaches 38 degrees F.
However, the unit needs to be connected to a power outlet and a gas supply in order for the freeze protection system to work. The Camp Chef HWD5 Triton is a great solution for recreational vehicles, campsites, cabins, and other similar applications. It’s cheap, compact, easy to install, and it comes with everything you need to have a hot shower right away. What more could you ask for? On the other hand, you basically get what you pay for so you shouldn’t expect too much from this little unit. The maximum flow rate it offers is 1.5 gallons per minute which is quite low, but still enough for a comfortably warm shower. We all know that every inch of space is important when you live in an RV, so the water heater should be as small as possible. The Camp Chef HWD5 Triton is 15 inches high and only 4 inches thick which makes it the smallest water heater on our list. It’s also one of the most lightweight water heaters you can find. It weighs only 15 pounds. The Camp Chef HWD5 Triton is a self-standing unit, but it also comes with brackets you can use to hand the unit to a wall. It also comes with a showerhead and an 8-foot water hose. The showerhead has 3 different settings – shower, mist, and jet. You also get a regulator hose that allows you to connect the water heater to a standard liquid propane tank. A 20lb propane tank is enough for approximately 11 hours of continuous use. The unit turns on automatically when you turn on your shower thanks to the automatic ignition system powered by 2 D cell batteries. A good water heater can make your RV really feel like home. On the other hand, a water heater that breaks down all the time or isn’t powerful enough can really make your life miserable. Here is a list of everything you need to consider in order to find the one that’s best for you. What Kind of Water Heater Can I Use in My RV? When it comes to water heaters for recreational vehicles, you can choose between a tankless water heater and a water heater that stores water in a tank. Traditional tank-style water heaters take up a lot of space. We all know that the space inside recreational vehicles is often very limited, so you’ll most likely need to make some compromises when it comes to the size of the tank. 6-gallon and 10-gallon tanks are the most common, but you can also find smaller water heaters with 4-gallon tanks. However, 4 gallons of water might not be enough for a comfortable shower. We believe that tankless water heaters are much better for recreational vehicles. They are much more compact, and they are far more efficient. Most importantly, tankless water heaters provide a continuous stream of hot water on demand. If you get a tankless water heater, you’ll never have to wait for the water to get warm enough. Most manufacturers offer tankless water heaters in a couple of different sizes. There are two factors that determine how powerful a tankless water heater is – the flow rate and the maximum temperature rise. The flow rate is measured in GPM which is short for gallons per minute. In order to determine how many gallons of hot water per minute you need, you’ll need to calculate the total flow rate of the devices you want to use. A typical faucet will have a maximum flow rate of around 1.5 GPM, and showers can deliver up to 2.5 GPM. However, a flow rate of 1.5 GPM should be enough for a decent shower, and this is often all you need in a recreational vehicle. If you want to use multiple devices at the same time (a faucet and a shower, for example), look for water heaters with higher flow rates. Once you figured out the flow rate you need from your water heater, you also need to think about the temperature rise. The colder the incoming water, the higher temperature rise you will need. Tankless water heaters use either gas or electricity. Both types have their advantages and disadvantages, so it’s hard to say which one is better. However, when you live in an RV, electricity might not always be available. If this is the case, an RV electric water heater will be quite useless. On the other hand, if you get a tankless water heater that uses liquid propane, you’ll have hot water anywhere you go. Most of them can be hooked-up to a standard 20lb propane tank which is fairly easy to find almost anywhere in the world. Do Tankless Water Heaters Work Without Electricity? Some tankless water heaters need to be hooked up to a power outlet even though they use gas as the main source of power. Tankless water heaters usually come with an automatic ignition system that turns the heater on when the water is running. Electricity is required for the automatic ignition to work. Most freeze protection systems on tankless water heaters also use electricity. However, some water heaters, like the Camp Chef HWD5 Triton and the Eccotemp L10, feature battery ignition. When looking for a water heater for your RV, it’s always a good idea to check how efficient it is. The higher the energy efficiency, the lower the annual operating costs. Furthermore, buying appliances that use less energy will not only lower down the cost, but it’s also better for the environment. The higher the energy factor, the smaller the amount of energy your water heater is using. In general, tankless water heaters that use gas have a much higher energy factor than electric tankless water heaters. You can use this guide to calculate the annual operating costs of your water heater based on the energy factor and the cost of fuel you are using. Every tankless water heater that uses gas needs to have a venting system. Tankless water heaters for RVs usually come with a direct venting system. This means they actually have two vents – one pulls the air in from the outside while the other serves as an exhaust. The air can either go through two pipes – on for the inlet and one for the exhaust – or through one concentric pipe. With a concentric vent, the hot air is insulated inside the cold air pipe, so the vent remains cold to the touch. The pipes can go through the roof or one of the side walls on your RV. With outdoor units, you don’t need any pipes. Being able to take a hot shower at the end of the day really makes life much easier. There is no reason why you shouldn’t be able to do it in your RV too. When it comes to tankless water heaters for recreational vehicles, a portable unit that doesn’t need to be connected to any outside sources of power is much more convenient. This is exactly Eccotemp L10 Portable Outdoor Tankless Water Heater is. With this water heater, all you need is a standard propane tank and 2 D cell batteries, and you can have a hot shower no matter where you are. The Eccotemp L10 was designed specifically for outdoor use which makes it perfect for RVs. It’s also a great solution if you need an outdoor area to clean up or wash your pets, for example. In conclusion, the Eccotemp L10 is definitely the winner in the best RV tankless water heater category.